I really had every intention of starting this blog in time for Me Made May, so I made my pledge and took photos and wrote imaginary blog summary posts, and felt a bit guilty (and silly) once May had finished and no blog had appeared. But I figure it’s not too crazily late for one big summary post, right? Me-Made-May’14 (MMM’14 for short) is a challenge designed to encourage people who sew/knit/crochet/refashion/upcycle garments for themselves to actually wear and love them. The me-made and self-stitched challenges have been taking place for over four years now and they work on both a personal and community level. The participants decide the specifics of their own challenge pledge, so that the month is appropriate and challenging for them. Based on the amount of me made clothing I have with me in Cornwall currently and to avoid too many repeats, I decided that my pledge would be to wear at least one item of me made or upcycled clothing on 15 days. Which, to be honest, is about a 5-fold increase in what I would normally wear in a month given my love of RTW jersey dresses. But enough of the waffle, let’s get on with the (very bad) photos, don’t let day 1 and 2 fool you; it deteriorates into badly lit selfies rapidly. Day 1: Grey, navy & green feather print jersey Lady Skater dress (pattern from Perfect Pattern Parcel #1). I also made my nephew’s green velvet smoking jacket, more info in a future post perhaps. Day 2: Black, blue & yellow viscose dress (self drafted). Day 3: Floral cotton lawn top (self drafted) and denim gathered skirt (self drafted). Day 4: Mystery silky fabric collared top (self drafted years ago) and upcycled cord skirt. Day 5: Floral chiffon & viscose faux placket top and another denim skirt. Day 7: Upcycled viscose skirt. Day 8: Navy & cream jersey dress (pattern traced from RTW dress). Day 9: Floral viscose dress (vintage pattern). Day 10: Zebra & striped jersey dress (lady skater bodice & self drafted skirt). Day 11: Repeated skirt from day 3. Day 12: Wearable muslin floral peplum (Simplicity 2444 bodice & self drafted peplum) and denim skirt from day 5. Day 13: Repeated feather lady skater again with an even more terrible photo! Day 14: Repeated skirt from day 7 and knitted cowl scarf. Day 15: Repeated skirt from day 4. Day 16: Repeated dress from day 10. In conclusion, I actually did 16 days wearing at least one me-made item, although towards the end there were quite a few repeats cropping up. 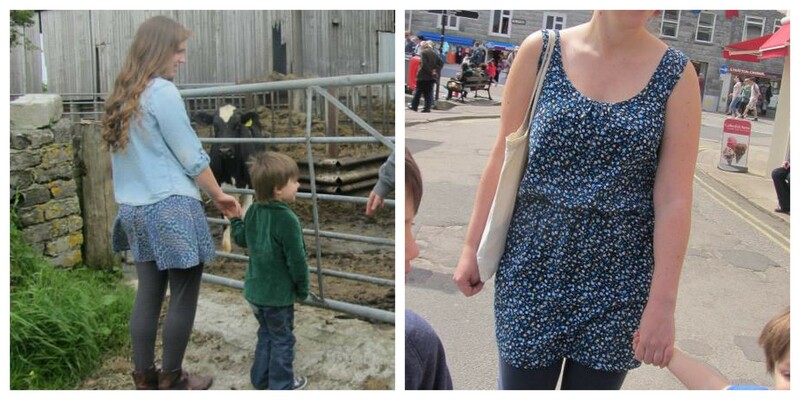 It has definitely made me more conscious of choosing more me-made clothes, and in the few weeks since the end of May, I think a higher percentage of my outfits have been me-made as I’ve finished a few dresses from the Simplicity 2444 pattern and an Ava dress from Victory Patterns. More on those later!